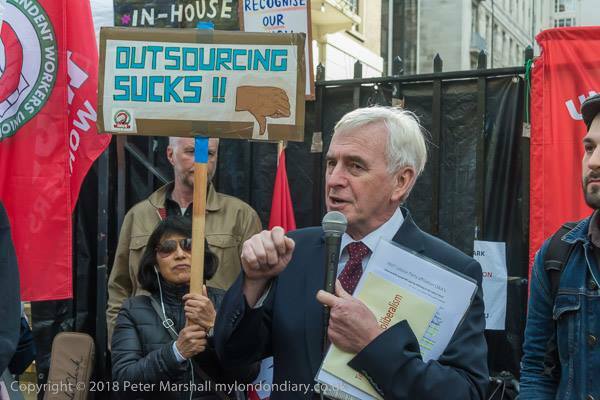 I am writing following last week’s massive strike and demonstration by outsourced workers to call on the University of London (UoL) to resolve this issue once and for all. As you must be aware, the situation at UoL has now become untenable. The year-long series of strikes, endless negative media and social media coverage, petitions from in-house staff and occupations by students have left the university’s reputation in tatters. We are now at a point where the campus is on perpetual lockdown, and the university is spending hundreds of thousands of pounds on additional security whose ID and bag searches are alienating staff and visitors alike. Meanwhile, outside the university gates MPs including the Shadow Chancellor line up to condemn the UoL stance. And all of this is merely to perpetuate an obvious injustice – namely the continued discrimination in terms and conditions against one group of predominantly BME [black, minority and ethnic] staff. As an aside, I know that one of accusation levelled against the IWGB is that it is in some way ‘extreme’ or ‘militant’. In fact, our members’ behaviour has been consistently reasonable – how would you like it if you were given much worse terms and conditions than your in-house colleagues, ignored when you attempted to raise this issue, told that the university would talk with neither you nor your chosen representatives and then have your entirely peaceful strikes and protests policed in a completely different fashion to those of your mostly white UCU [University and College Union] colleagues? Furthermore, I have on their behalf raised a series of issues relating to the behaviour of the outsourced companies to which the University has simply failed to respond. What other option have they been left with to have their voices heard? Please watch this space for details of our May protest – it’s going to be a big one! As ever, and to combat any further accusations of unreasonableness, the IWGB remains open to direct talks over the implementation of the in-house process.